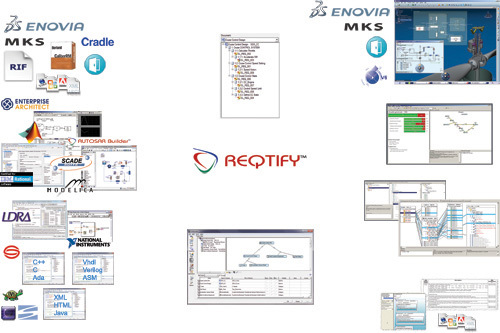 Reqtify provides connectors to a wide range of engineering tools to ensure that it can easily be integrated into your existing engineering process and start improving the project quality. It offers the most comprehensive list of interfaces on the market, ensuring compliance with your engineering needs. Reqtify can capture data from any source (file, database) and analyse it to understand the relationships between these different data sources. This enables requirements to be linked to specifications, implementations and test cases and provide insights into the extent of coverage and understand the impact of proposed changes. Several partnerships with major customers and tool vendors have been initiated to create this unique added value and make Reqtify™ the most effective solution to link development and verification processes with requirements, wherever they come from.